As a father to two young children, it’s hard to listen to Sockweb‘s début LP Werewolf and not feel like you’ve come up a little short in the parenting department. You see, this Richmond, Virgina-based grindcore band has a rather unusual and completely beguiling central concept: their vocalist is a 7-year-old girl. 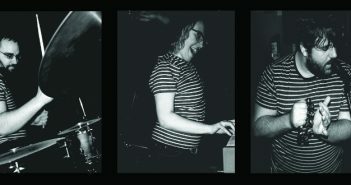 More specifically the vocalist, Joanie Young, is the daughter of Sockweb’s only other member: her father, Adam Young. A two-piece father / daughter grindcore band? It’s hard not to be won over before you’ve even heard a blastbeat. Chances are, you’re already aware of Sockweb after their début song ‘I Want Pancakes’ became a viral smash earlier in the year. After all this time and with hundreds of thousands of Youtube and Soundcloud hits to its name, it remains an undeniably fantastic song, and certainly an attention-grabbing one. 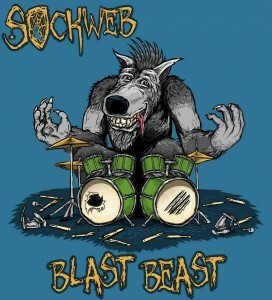 It encapsulates everything that makes Sockweb such an enticing listen. Multi-instrumentalist Adam Young packs its 80-second runtime with enough grind flourishes to make the head spin, and hits all the major touchstones (stuttering, blasting beats during the intro drop into a mid-paced death metal riff backed by constant pounding from double bass drumming) while Joanie Young (in slightly restrained mode compared to what’s to come) shouts her head off about her breakfast. As far as novelty metal songs go, it’s certainly up there. The mixture of relentless grindcore (normally a visceral and decidedly adult genre) with the vocals of a child yelling about cereal? It’s hard to imagine a cooler juxtaposition. One of Sockweb’s many achievements is their ability to simultaneously go for the jugular at the same time as making you go “aww how cute” and ‘I Want Pancakes’, thanks to Joanie Young’s shout-talk vocals, has that in spades. It also allows for fantastic puns. The adorableness doesn’t stop there either. Samples from kids TV shows are littered throughout the album; a Scooby Doo battle-cry during the opening barrage of ‘Werewolf’; an appearance from SpongeBob SquarePants and his inimitable laugh to kick off ‘Cletus The Fetus’ (who, after his connection with Job For A Cowboy, is possibly the most metal cartoon character ever) and, my personal favourite, a brief glimpse of BMO from Adventure Time (I won’t spoil where) to name but a few. Usually, a childish sample dropped into a metal record is either played for creepiness or to affirm just how ‘zany’ a band are. Here, it feels like an essential part of Sockweb’s fabric. Kids are always talking about their favourite things that they watch on TV, why wouldn’t they litter their very own grindcore record with it? And don’t think for one second you’ll be any mistaking this record for anything but a grindcore record. Joanie Young’s vocals on ‘I Want Pancakes’ are effective enough, but if that’s all you’ve heard, prepare for a shock as she screams like a howling wind across the rest of the tracks and, incredibly, holds her own against an admirable roster of grown-up grind guest stars and her father’s own brutish grunts. Speaking again as a dad myself, it is (and please don’t mistake this for hyperbole) honestly incredible that these sounds are coming out of the throat of a 7-year-old. Witness how she goes toe-to-toe with Agoraphobic Nosebleed‘s Katherine Katz on the incendiary ‘Salamander Karate’, snarling and roaring with a venom that equally matches Katz’ own. Adam Young is no slouch on the musical front either, offering up a varied palette and impressing as the sole instrumentalist, give or take a few guest guitar solos. Given heft by Scott Hull’s (yes, that Scott Hull ) beefy production, his compositions are lean and incredibly mean; varied and breathless. He borrows liberally from grindcore stock (Agoraphobic Nosebleed’s Frozen Corpse Stuffed With Dope is an obvious touchstone, from the sample-heavy construction down to Young’s impressively frantic drum programming) but injects plenty of flourishes to keep you guessing, and pulls from outside influences to add a fresh spin. ‘Spoon’ crosses over into black metal territory with its muted gothic synths backing a showy guitar solo, and the aforementioned ‘Salamander Karate’ begins with a pinch of down-tuned djentian hammering. His arrangements occasionally sound a little too derivative to hold the attention fully, most notably on ‘Cletus The Fetus’, (where Joanie is largely absent), but for the most part he delivers a technical and interesting avalanche of aggression. For all its musical triumphs, however, it’s Joanie Young who is undoubtedly the star of the Sockweb show. We as adults may think that life only starts to get hard once you get older, but something that having kids has reminded me is that it was never easy. Relatively speaking, stress and anxiety begins at an alarmingly young age, and hearing the perspectives of such a young person, screaming over the top of a solid collection of grindcore, is refreshing beyond comprehension. We all know that schoolyard ‘Bullies Are Mean’ (where would Korn‘s Jonathan Davies be without them?) but hearing Young scream about playground injustice over her dad’s rampant drum programming and lightspeed riffs provides a vicarious catharsis that you just don’t get anywhere else. Début records often leave you in anticipation of what comes next. Never more so than with Sockweb.